AUSTIN, Texas, April 19, 2011 (ENS) – A unprecedented wildfire situation in Texas has set more than 1.5 million acres ablaze, forced hundreds of people to flee their homes and destroyed hundreds of homes and buildings. Resources across Texas have been spread thin battling numerous wildfires spawned by historic drought and critical fire weather conditions. In a letter sent to President Barack Obama late Saturday afternoon, Texas Governor Rick Perry requested a Major Disaster Declaration for the state as a result of the widespread wildfires and continuing fire danger across the state. A Major Disaster Declaration makes the state eligible for response and recovery assistance from the federal government. 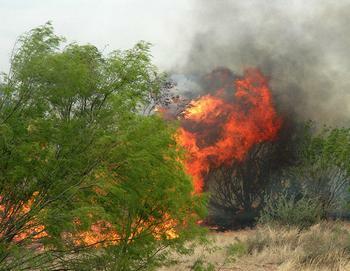 The governor identified 252 Texas counties presently threatened or impacted by wildfires. Texas is in the midst of one of the worst droughts in a century, says Dan Byrd, meteorologist with the National Weather Service in Jackson, Mississippi. According to the latest analysis by the U.S. Drought Monitor on April 12, 2011, the entire state of Texas was experiencing abnormally dry or drought conditions with most areas in a severe to exceptional drought, even by Texas standards. In this critical fire weather with abnormally high temperatures, low humidities and strong winds, fires are starting easily, increasing quickly and burning longer. Since the wildfire season began, Texas has responded to 7,807 fires across the state that have burned more than 1,528,714 acres and destroyed 244 homes. Rescue efforts have saved 8,514 threatened homes. Texas is requesting direct federal assistance including aviation assets and wildland, structural and wildland/urban interface firefighting resources to state and local agencies in support of firefighting operations. The state is also requesting emergency protective measures to save lives, protect public health and safety, and protect improved public and private property. The governor first issued an Emergency Disaster Proclamation on December 21, 2010, which has been renewed every month, with the latest proclamation on April 15. This proclamation remains in effect as extreme wildfire conditions persist. Currently, the largest fire is the 584,558 acre Trans Pecos Fire Complex, burning across 36 west Texas counties. In an effort to slow the spread of the flames, ground crews have been working in concert with helicopters and fixed-wing aircraft for air reconnaissance and water and fire retardant drops. On Monday, the Texas Forest Service called for additional aerial resources. In response, four Modular Airborne FireFighting Systems and a DC-10 airtanker on their way to help battle the wildfires. Congress established the MAFFS program in the early 1970s to provide military support for civilian air tankers. Each MAFFS unit, a 3,000 gallon tank installed on C-130 aircraft, can drop a swath of retardant one-fourth of a mile long and 60 feet wide. The DC-10 is a modified McDonnell Douglas aircraft that can hold more than 11,000 gallons of retardant. The plane can be filled in eight minutes and its computerized, gravity-fed water dump system can release its entire load in eight seconds. It creates a swath three-quarters of a mile long and 300 feet wide. 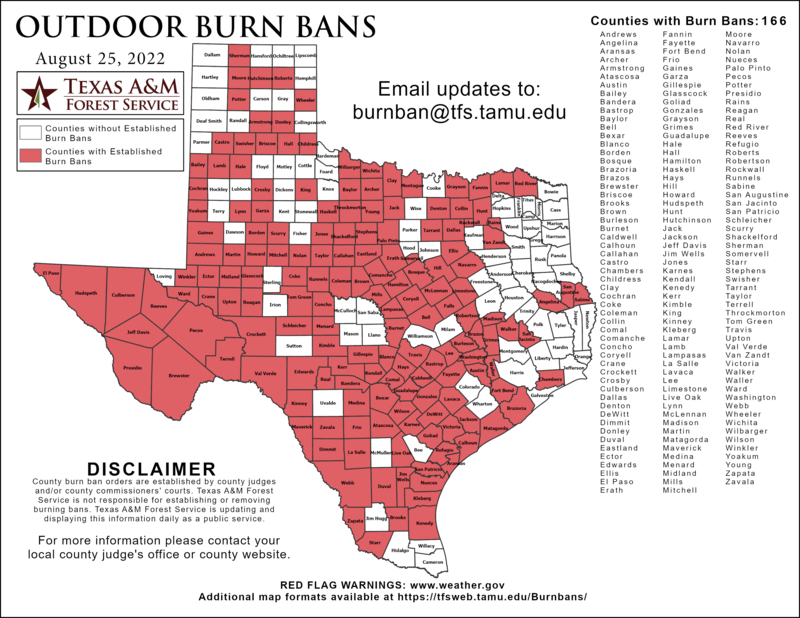 Burn bans are currently active in 201 counties. Click here for more information on preparing for wildfire threats.